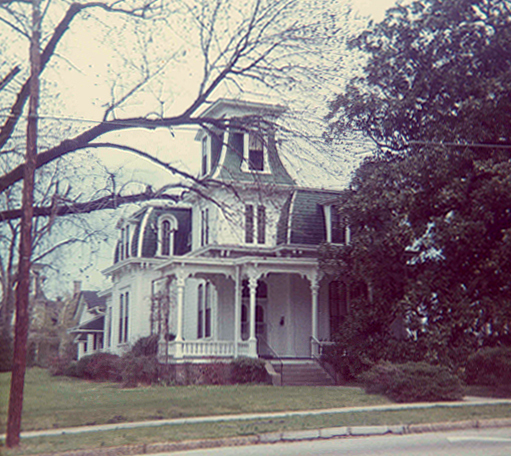 Above is the Heck-Lee House in 1972. Below is a view taken last night. Back in 1971-72 or so, before Oakwood became “Historic” Oakwood, I would often ride my bicycle through the neighborhood (with my Kodak Instamatic, of course) and take snapshots of the faded Victorian houses lining the streets. I remember being intrigued by three near-identical, flamboyantly-towered structures that comprised a corner of E. Jones and N. East Streets. They appeared to me as miniature versions of the opulent Heck-Andrews mansion on N. Blount St. Hmm, I wondered, could there be a connection? Col. Jonathan M. Heck and his wife Mattie moved to Raleigh from Warren County shortly after the end of the Civil War. A wealthy landowner and businessman, Col. Heck hired New Jersey architect G.S.H. Appleget to design his city residence. 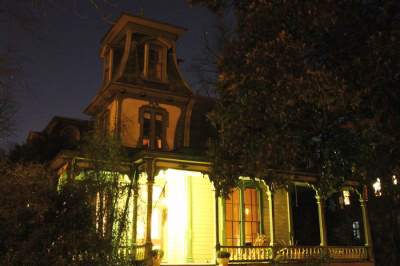 At the time of its completion in 1870, it was one of the grandest homes in Raleigh. Appleget designed the mansion in the then popular Second Empire style. It featured two full stories topped with a characteristic half-story mansard roof, and was accented by a dramatic three-story central tower, itself topped by a convex mansard roof. The house was the showcase of the neighborhood and set the tone for residential development along Blount St. for the next quarter century. The Heck-Andrews House on Blount St. in 1966. Its architect, G.S.H. 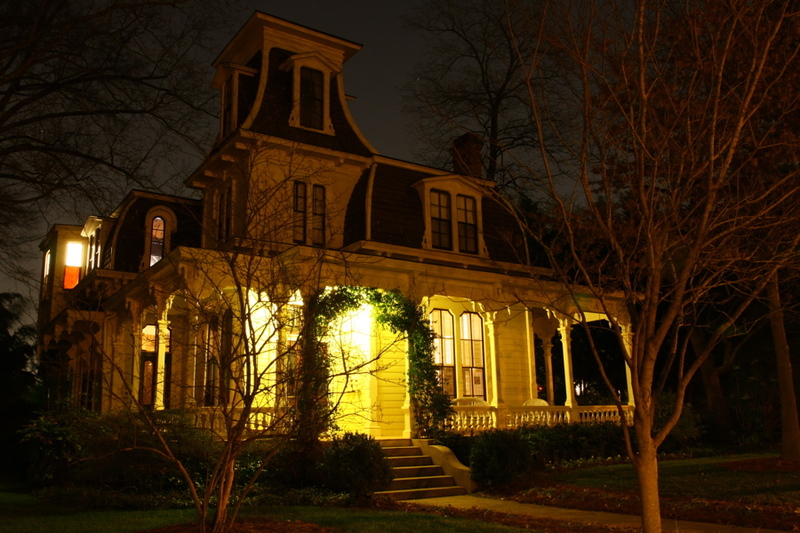 Appleget also designed the Andrews-Duncan House (1875) located across North St., and Estey Hall on the Shaw Campus (1874). During the 1870s Col. Heck promoted the development of the neighborhood we now know as Oakwood. He acquired large tracts of land that stretched eastward from the vicinity of East St. out to the area near St. Augustine’s College that later became Idlewild. He subdivided his property into building lots, and between 1872 and 1875 built —on speculation— the triplet of houses at Jones and East Streets. Their distinctive design is attributed to his own architect, G.S.H. Appleget. A shrewd businessman, Heck probably figured he could get more “bang for his buck” if his spec houses were similar in style, size and material. In fact, they are nearly identical to each other. By 1880 the corner house had been sold to James W. Lee, Raleigh’s police chief, and its Jones St. neighbor to J.W. Wynne. Heck retained ownership of the East St. dwelling, probably using it as rental property. The Heck-Wynne House at 511 E. Jones St. was once owned by an accountant for Briggs Hardware. During the Great Depression he sectioned it off into quandrants to rent out so he wouldn’t lose it; it has been divided up ever since. 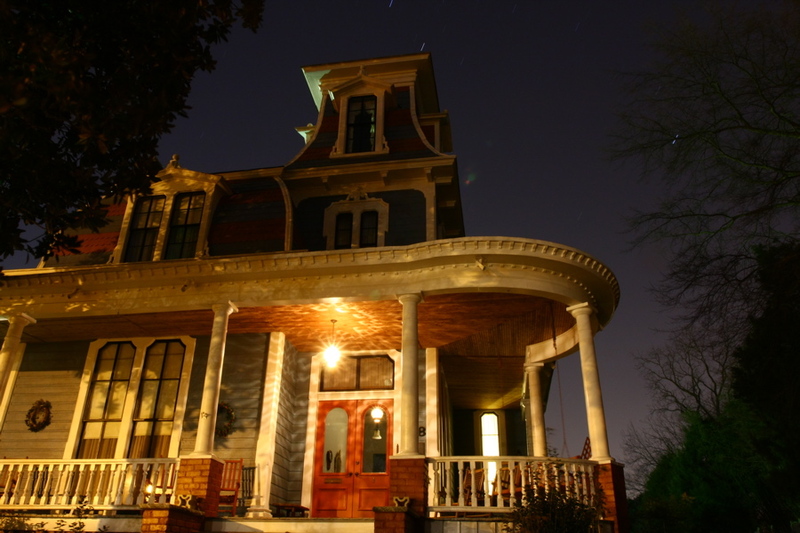 This Heck House on N. East St. sits high up above the street and offers a commanding view. Some sources, however, in citing the origin of the Jones/East St houses attribute their construction to James Lee himself. 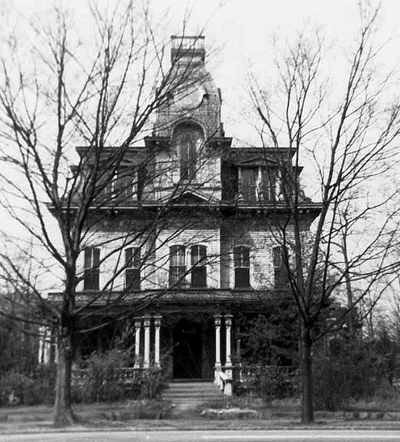 One source claims Lee built the houses between 1872 and 1882 for members of his own family, and that they were constructed of lumber shipped to Raleigh from a virgin pine forest in Virginia. Another source even attributes their design to William Percival, architect of Montfort Hall, First Baptist Church and the Tucker Mansion. This is highly unlikely, as Percival did not work in the Second Empire style, and, in fact had left Raleigh in 1861, more than 10 years before their construction. Despite conflicting theories on the provenance of the Heck Houses, I remain convinced that Col. Heck did build them, with G.S.H. Appleget as his architect. But I will say, though, as with many things in history: It is often all a matter of…speculation! 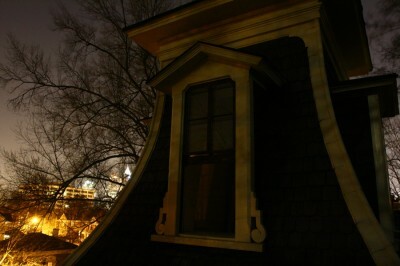 The Federal Building on New Bern Ave. can be seen in the distance from the tower of the Heck-Wynne House. 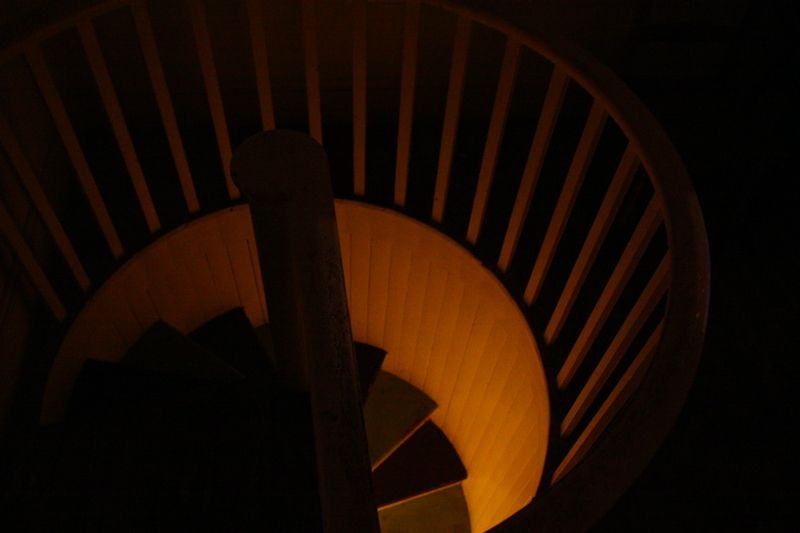 This is the circular staircase which leads to the tower. Special note from the Editor: I’d like to give great thanks to Mike Rosado for graciously giving me a tour of his residence (part of the Heck-Wynne House), allowing me to photograph the inside, and providing a bit of the history of it. Again – thank you thank you THANK YOU! Your old photos – and the informative text accompanying them – are just wonderful. Thanks for your kind words NCSU! And stay tuned– there’s more to come! you were right, john — probably the coolest place to live in raleigh. now we just have to convince mike to throw an inauguration day party. This is great! I lived next door in the then-compartmentized, now single-family residence at 519 East Jones. I think it was Taylor, who owns the Heck-Wynne House, who told us that his house along with the other two were known as the “Three Sisters”. The name was given for the 3 siblings that a father (James Lee?) built the homes for. I just assumed that the facts were known. The text is great accompaniment to the photos. I miss our old apartment! I get it! Speculation! Brilliant! 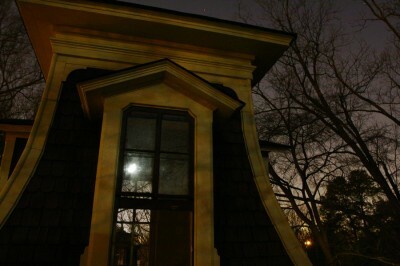 Great post RB and great photos John, especially the one looking up toward the Heck house. 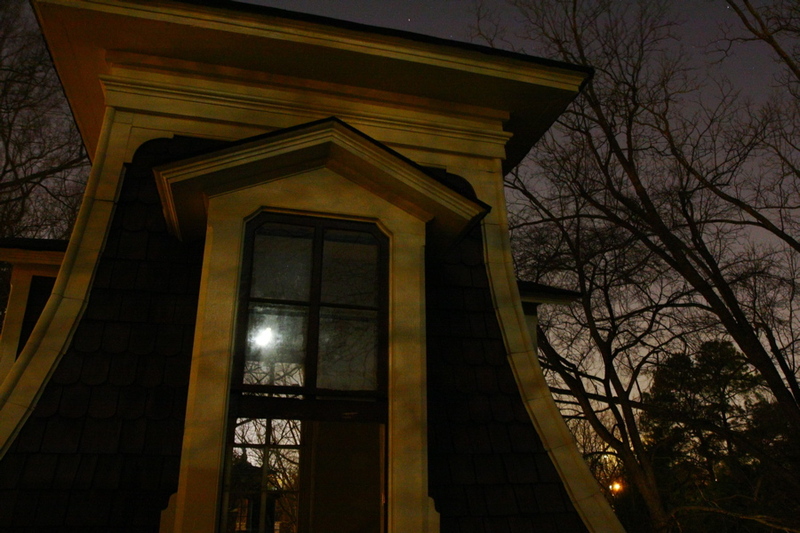 The reflection of the lights on the porch ceiling is beautiful. That’s fascinating info, RB, and wonderful photos. I’ll have to ride by on my way home. I didn’t know about the Three Sisters. Thanks! 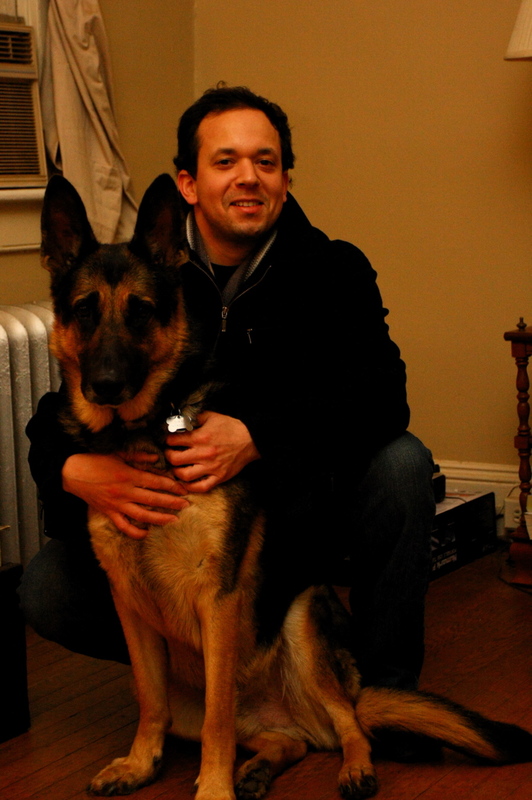 Arial, Ben, jz–thanks for the comments! Yeah, one thing I’ve learned over the years about some of them Oakwood folks is once that proverbial snowball gets to rollin’ you never know where it’s going to end up! RB – I’m ready to see some pictures of you marching on the Uncle Paul Show. I know you must have some! Actually, I go back a little bit further than that…I did the Captain 5 show, Uncle Paul’s predecessor! Man I’m loving the night photos. I don’t remember Captain 5. And I have “Die Die My Darling,” with the inimitable Tallulah Bankhead, on DVD. Got it off Turner Classic Movies about a year ago. Tealwomin– Thanks for the tidbit on your memories of the Heck Houses! And NCSU– Yes, it was Captain 5 and His Happy Harbor! Uncle Paul played the electric organ on it until he got his own kid’s show in the mid-60s. Hi, I am trying to find any pictures taken of the interior of the Heck Andrews House. I have seen many pictures of the outside (and have visited the house numerous times), but I am so very curious to see the inside of this house. If anyone knows how I could find these, I would appreciate it so much. Patti — There are photos of the interior of Heck-Andrews. I am working on getting copies of them, and when I do, I will post them. I’ve been inside the house, from the basement to the tower, and I can tell you, the rooms are ENORMOUS! That visit was an awesome experience for me, as I’d always wanted to go inside since I was a kid. Thank you for the feedback. I am looking forward to seeing those pictures! I would love to see the pictures of the inside of the Heck Andrews house also. I have a carved chest and two pictures from the house also a small chair. There was a large four poster bed that my mother had from the house but I do not have it. Thanks for the interesting information. I believe that part of the allure of history is in not knowing the exact truth. 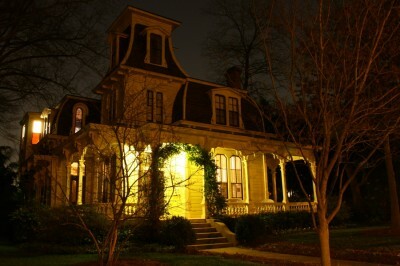 The Heck-Andrews house on North Blount Street is my favorite house in Raleigh! What a wonder it must have been in its day. I’ve stopped there many times over the years and have held out hope that someone would restore it. I imagine that would be a tall order … but it’s a great house!